An interesting take on the side-scrolling racer game will be hitting the App Store later this week. 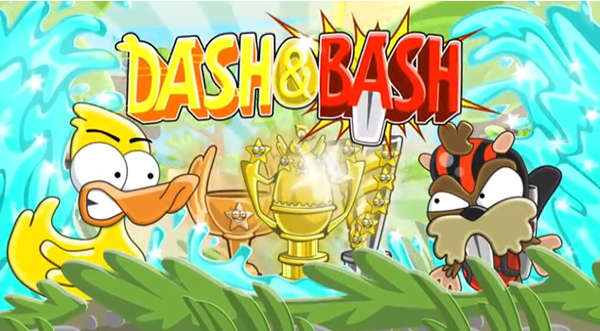 From developer Touch.Play.Repeat, Dash & Bash will allow gamers to race as Dash the Duck against the clock or against archrival Bash. Taking place at the Spring Banks Racing Championship, Bash is the current champion and wants to make racing impossible for poor Dash. So he’s filled the course with a number of obstacles. And Dash must swim, fly, dive, and shoot through everything thrown at him to win the race and the championship. Here’s a quick promo video about the title. Click here if you can’t see the video. Once a gamer achieves a three-star score on a track, the VS BASH mode is unlocked. In the advanced mode, Dash battles against Bash in a high-speed drag race. If Dash wins, he’ll take home a golden egg. The eggs can then be used to win trophies and unlock outfit upgrades. Along with the 25 races tracks, the game will also have an easy mode for younger players. That’s a great idea that I’d like to see other games feature. Dash & Bash is designed as a universal title and will support the iPhone/iPod touch and iPad/iPad mini. It will be available to download on Sunday, May 5 in the App Store. The price was not announced. The game looks like a lot of fun, and I’m interested to try it out.